Picnic at the park on the grass. A summer picnic can create tons of memories with family and friends. The great thing about picnics is that they can include any number of attendees. Where some would rather have an intimate snack with a friend or two, others ask over ten people to join them. Regardless of the size of the picnic, there is always some thought that goes into the menu of the event. What to make? What to bring? Does anyone have any food allergies? Of course, there are a lot more questions you should ask. Not just that, but in a time when dietary restrictions are on everybody’s mind, it can be a daunting task to choose a menu that will satisfy the hunger and health priorities of everyone attending. Typical picnics and barbecues have loads of mayonnaise-based salads, hamburgers, hot dogs, and high sugar deserts. Also, most people will wash that down with carbonated soft drinks or alcoholic beverages, which, in many cases, there will be more of those beverages than drinking water, which isn’t very healthy. According to the American Diabetes Association. “75% or more of the sodium Americans eat is from processed, packaged foods” (diabetes.org, 2015). 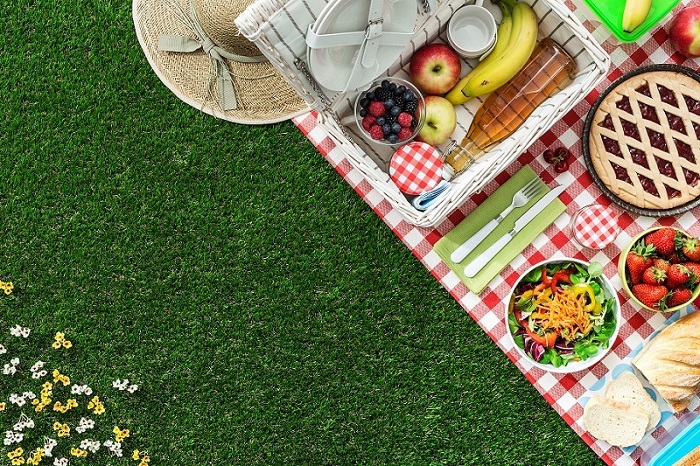 Fortunately, summer is when most picnics take place, and that’s also the peak of the fruit and vegetable season, which means prices on some great non-GMO produce will drop. This means that you are able to buy a lot healthy stuff for the event. Think about it, the more colorful your meals look, the healthier they are for people. Buy stuff like peaches, berries, cherries, watermelon, tomatoes, corn, zucchini, and peas. These are all great choices to include on a fruit and veggie platter. Here is a list of healthy menu options that you may want to consider for your picnic menu this summer! Add any of these options to your water for a refreshing beverage choice. These are great snacks for both the kiddos and the adults.